Commercial Appraiser-Appraisal 310.337.1973 - The Bureau of Real Estate Appraisers (BREA)/Appraisal Institute /MAI Sleep while the Real Estate Industry Burns! The Bureau of Real Estate Appraisers (BREA)/Appraisal Institute /MAI Sleep while the Real Estate Industry Burns! The Bureau of Real Estate Appraisers (BREA)/Appraisal Institute /MAI Sleep while the Real Estate Industry Burns! In the past I have spoken on the errors many appraisers make with time adjustments but if the attached chart is accurate they appear to be making erroneous adjustments with respect to Living Area and Room Count. 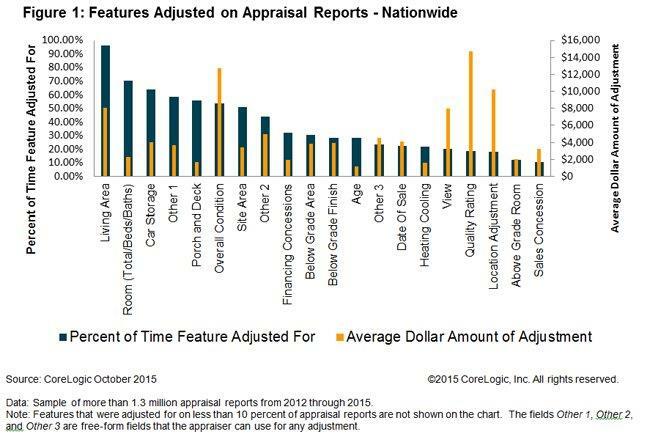 The chart seems to show that 95% of all appraisals studied make adjustments for Living Area while 70% are adjusted for Room Count. This means that 65% to 70% of these appraisals are adjusting for both Living Area and Room Count. My concern is WHY? The Bureau of Real Estate Appraisers (BREA)/Appraisal Institute /MAI Sleep while the Real Estate Industry Burns!